Given that corporations are run by people, and people are social animals that run in herds, it shouldn't surprise us that corporations follow the herd, too.Take the herd move to forming conglomerates in the go-go late 1960s: corporations suddenly started buying companies in completely different sectors in businesses they knew nothing about, because the herd was forming conglomerates--not because it made any business sense but because it was the hot trend. Fast-forward to the late 1990s and early 2000s, when the corporate herd was offshoring production to east Asia. On one of my trips to China in the early 2000s, I sat next to a youthful corporate manager in the semiconductor equipment sector. The flight being long (10-11 hours), we were able to have an in-depth conversation about his company's dismal experience with offshoring production from the U.S. to China and other nascent manufacturing hubs in east Asia. It turned out the offshoring had been pushed by top management over the objections of senior managers who actually knew what they were talking about. The herd was running, and top management wasn't going to take no for an answer. The offshoring was a disaster. The company lost control of quality, and the units shipped from Asia were chockful of defects, defects that were extremely expensive to fix after manufacture. The company's intellectual property was stolen ("borrowed"? ), triggering costly but useless legal actions against the thieves. Financially, the offshoring cost the company millions' in direct costs and indirectly in loss of reputation and IP. This is not an outlier: many companies experienced catastrophes in following the offshoring-is-great lemmings off the cliff. I have first-hand accounts of pharmaceutical companies closing their China operations due to pirating (worthless knockoff medications sold in packages that were perfect replicas of the company's products), and of clothing manufacturers who left after entire runs of costly silk clothing lines were rejected for abysmal quality. Now the corporate lemmings have rushed into mobile/social media advertising. Never mind if the adverts work--we need a mobile presence now, and hang the cost! 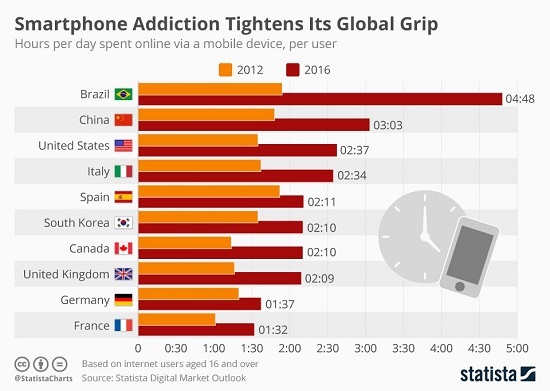 The urgency was driven by the consumers' mass shift to mobile devices, fueled by the rising global addiction to small screens. Now that tens of billions of dollars have been poured into mobile/social media adverts and marketing, enriching the quasi-monopolies (Facebook, Google et al. ), sober managers are starting to ask: but do they work? Did all this treasure poured into mobile/social media adverts actually increase sales and profits? Which campaigns worked and which ones didn't? Nobody seems to know how much of their advert millions have been squandered on click fraud. Is this any way to run a marketing division? Of course it isn't. The lemmings rushed into mobile anything / everything, heedless of cost or value, and now as the lemmings race off the cliff, questions are being asked about the efficacy of the headlong rush into mobile/social media advertising. What if it turns out a significant chunk of sales derive from SMS (text) messages between consumers, i.e. "word of mouth"? (Thank you, Mark G., for alerting me to this largely unexplored topic.) What if all this "behavioral advertising" turns our to be high-falutin hooey? We've already read about some corporations trying the most basic experiment: withdrawing their mobile campaigns from the quasi-monopolies and monitoring the withdrawal's effect on sales. All of this is of course a deep dark secret within HQ, because as we know, top managers will bury whatever reflects poorly on their lemming-like herd behavior, and the failure of mobile advertising is equally secret, amounting to a sort of marketing trade secret: let our competitors run off the cliff, wasting their marketing budgets on mobile/social media campaigns. Reading the runes made public, it seems sales were unaffected by the withdrawal of huge chunks of mobile / search / social media adverts. Efforts to actually measure and track click fraud are turning up gigantic losses: advertisers' money is being siphoned off by click fraud on an immense scale. NOTE: it seems lemmings don't actually run off cliffs in herds, and so please note that I reference lemmings only as a popular cultural device, not as a reflection of biological fact. My abject apologies to any lemmings reading this essay. Thank you, Frank M. ($100), for your outrageously generous contribution to this site -- I am greatly honored by your steadfast support and readership. Thank you, Anthony W.-I. ($10), for your most generous contribution to this site -- I am greatly honored by your support and readership.